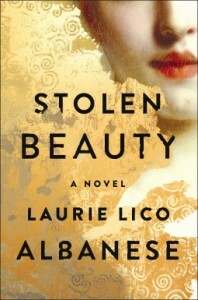 STOLEN BEAUTY moves from 1900 to 1938 as we follow the lives of Adele and Maria. In 1900, Adele's story was about her life and how she became fascinated with the painter Gustav Klimt and that era of art. In 1938, the story is told of Maria, Adele's niece, newly married and taken from her home​ and taken from her husband​ at the beginning of WWII when Hitler invaded ​Austria. STOLEN BEAUTY was interesting​, but since I am not an art aficionado, I was a bit confused. Despite my lack of knowledge in the art area, though, I did learn a lot about Gustav Klimt. The WWII sections were heartbreaking as usual. I do have to say I enjoyed the story of Maria more than Adele, but most likely because I don't know too much about art. Maria also seemed to be a warmer character than Adele. It took me halfway through the book to warm up to the characters, and even though it wasn't a favorite, I enjoyed the book. Ms. Lico Albanese did a marvelous job of researching, and she has wonderful, descriptive writing.